For Christmas my wife gave me tickets to Carnegie Hall in New York. It has the best acoustics of any auditorium I have ever been in. We went to hear one of the four concerts of Beethoven symphonies performed by the West-Eastern Divan Orchestra conducted by Daniel Barenboim. I cannot believe that someone with that much to give does not have a title in front of his name. The orchestra was founded by Barenboim and his friend the Palestinian-American scholar Edward Said. It consists of Israeli, Palestinian and other Arab musicians. It was thought of as an experiment believing that people who live together and play together must have a dialog. What can be more important in the Mid-East. I cannot comment on the politics within the group but from the way they play they will all go straight to heaven. The first notes I heard tonight of Beethoven’s Pastoral (6th) Symphony brought tears to my eyes, it was so beautiful. It is incredible to watch Barenboim conduct. Sometimes, for moments, he allows the orchestra to play with no guidance and then at just the right moment he points to the wind instruments or the strings to bring them in in a forceful or quiet manner. At times he seems to scold with his fist and then he lets his fist and baton fly as he builds the orchestra to great new heights. He obviously pushes his pupils and expects them to give their all as he does. I found it quite cool in the hall and kept my coat over my knees but the Maestro and his orchestra were pouring sweat and the handkerchief to wipe the brow came out more than once. At one point there was a thud in the orchestra and one could see a fleeting concern cross the maestro’s face, had an instrument fallen had a chair or musician collapsed but as quickly as it came it dissolved and Barenboim plunged back into the music. 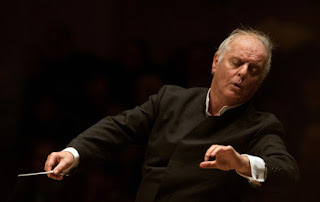 It is obvious that Barenboim knows the score intimately as does his orchestra and the Maestro does not have music in front of him. I had the feeling, that as far as the orchestra was concerned the musicians had the score but they were too deep into the music to even look. It seems very much a case of teacher and pupils working together to give an exquisite performance, one that they can both be proud of. When the symphonies were finished the shouts and standing ovation did not cease. Barenboim came up to the front for a couple of bows but for at least three of the “curtain calls” he just stood among the musicians signaling various instruments to step forward to be recognized and he shook hands with numerous musicians individually and he even hugged one or two. He was obviously as thrilled at the way they performed as the audience was. After the conductor left the stage for the last time many of the musicians shook hands or hugged each other as well. What an incredible evening and what an incredible treat this was. I plan to buy the Barneboim/West-Eastern Divan Orchestra 5 set CD of all the Beethoven symphonies, but I doubt it will be nearly the magical experience that the live performance was. Terrific post! Barenboim & West-Eastern Divan Orchestra - a resounding "YES! ".